While India lacks semiconductor fab plants, its good to know a Bangalore based semiconductor related manufacturing equipment company called Hind High Vacuum Co. Pvt. Ltd. (HHV) has developed a unique thin film technology solution for the nuclear energy sector. This cluster type thin film deposition system is indigenously developed out of its Bangalore facility is successfully installed at customer site, a leading nuclear research centre in India. This thin film deposition system is used to deposit a stack of multi-layer thin film coatings to fabricate miniaturised, solid state boron carbide sensors which are used in the nuclear energy field. HHV design, develop and manufacture off-the-shelf and customized equipment and products in the fields of Vacuum Technology, Solar Photovoltaic and Thin Films Technology, which is extensively used in semiconductor manufacturing. 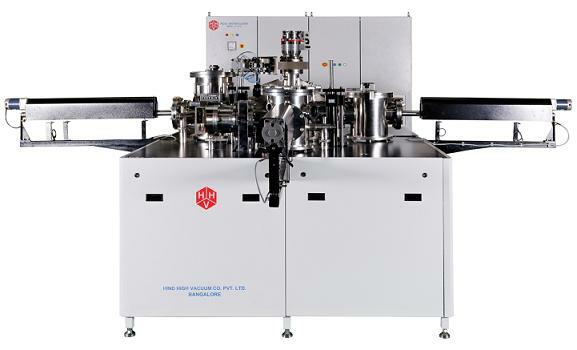 This cluster type thin film deposition tool has 2 PECVD process chambers to fabricate p-n junction layers, 1 sputtering process chamber to sputter various magnetic and non-magnetic metal films, 1 substrate loading /unloading chamber, 1 transfer chamber and 2 sublimation units to feed the precursors to the PECVD process chambers. The cluster type thin film deposition system has been integrated with industrial PC based, PLC and SCADA software for total automation of process and vacuum cycle. An optical emission spectrometer integrated with the PECVD process chambers enables to measure the plasma emission and boron (or) carbon content in the coated boron carbide films.